Is there an award for record amount of flip flops? The presidential debate is over and the media has pretty much declared Mitt Romney the winner of the first round between himself and the president. Romney did in fact have a strong performance, going on the attack from the beginning, stomping all over moderator Jim Lehrer in the process and issuing several whoppers to the American public, but why should he care? Many Americans don't do their own research and the Romney camp is fully aware of this. It is for this reason that Romney's campaign has made comments dismissing fact-checkers and declaring Romney the "Etch-a-Sketch" candidate. Well, now that everyone has had a chance to comb through the debate and pick it apart bit for bit, The Midnight Review has decided to do it's own analysis of the debate, focusing on the comments made by Mitt Romney. During the debate the president offered more details and sources to find even more information but when Romney was asked even "yes or no" questions regarding his support for an issue, Romney refused to answer. 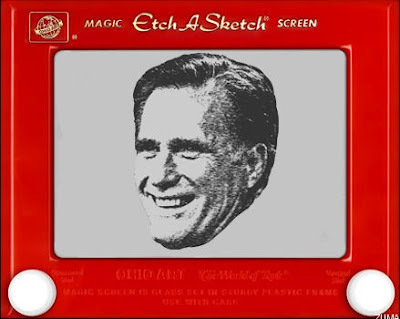 It also seemed that Romney has decided to shake the Etch-a-Sketch for the debate because many of his positions that he espoused to the nation seemed to directly contradict comments he had made as early as a few days before the debate. So, without further ado, here is the analysis (Romney's comments will be highlighted in a different color). "My plan has five basic parts. One, get us energy independent, North American energy independent. That creates about 4 million jobs. Number five, champion small business. 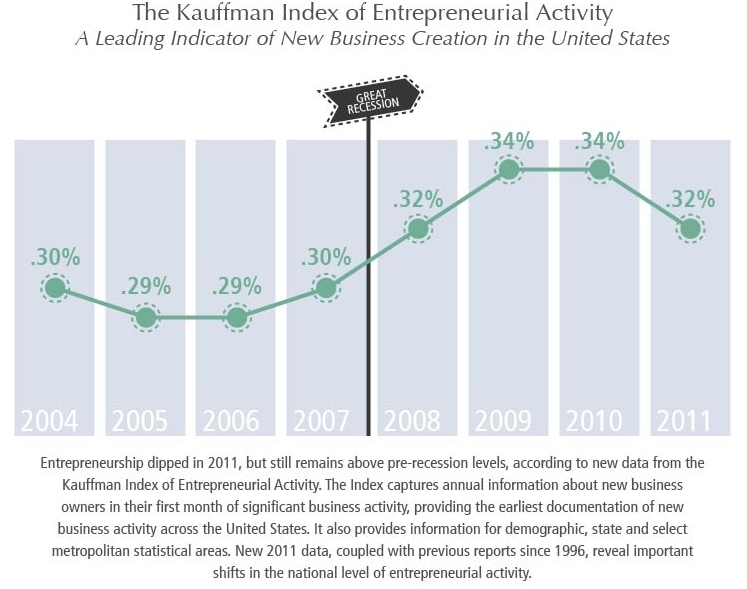 It's small business that creates the jobs in America, and over the last four years, small business people have decided that America may not be the place to open a new business because new business startups are down to a 30-year low." Unlike fellow Republican Rick Perry, it looks like Romney was able to remember all the points to his plan, but is Romney really offering up an accurate portrayal of his policies to the American public? Romney's first point, energy independence is interesting because during the debate he praises green energy but criticizes the president for investing in green energy, and at one point, Romney seems to defend tax subsidies for the oil industry. Romney's second point, international trade is interesting because throughout the campaign trail, Romney has criticized manufacturing losses under the president but now he would want Americans to purchase goods from other nations, especially Latin American ones? Mexico is already America's second biggest trading partner (right behind Canada), and a good portion of imports consist of cheaply manufactured goods. By opening up trade with Latin America, Romney would risk increasing the exodus of American manufacturing jobs. Romney's third point, regarding education was interesting. Romney actually admits American schools are far from being number one. America is ranked 31st in mathematics and 23rd in science globally. China is first in both categories. The only problem is that Debate Romney supports education while Campaign Trail Romney attacked investment in education. On June 8th, Romney said of Obama, "he wants another stimulus, he wants to hire more government workers. He says we need more fireman, more policeman, more teachers. Did he not get the message of Wisconsin? The American people did. It's time for us to cut back on government and help the American people." Later in the debate Romney seemed to reject the notion that he was against increasing the number of teachers, saying "I love great schools" and then stating that he rejects "the idea that I don't believe in great teachers or more teachers," and that it is best left up to the states to make such decisions. He also criticized the presidents' green energy initiatives, claiming that with the money spent on things like solar and wind energy America could have hired two million teachers. So is he for or against education and green energy? Romney's fourth point, wanting a balanced budget, is interesting considering he later declared that you cannot balance the budget with increasing taxes and that he had no desire to increase spending (except for the military). How does that math work out? Romney's last point, championing small business, is just a flat out lie. Romney claims that new businesses are at a thirty year low but according to studies, particularly one by the Erwin Marion Kaufman Foundation - the world's largest foundation devoted to entrepreneurship, business creation has actually increased under President Obama. Another interesting aspect of the study was that most new job creators are started by America's immigration population, which Romney wants to crack down on. "First of all, I don't have a $5 trillion tax cut. I don't have a tax cut of a scale that you're talking about. My view is that we ought to provide tax relief to people in the middle class. But I'm not going to reduce the share of taxes paid by high-income people. High-income people are doing just fine in this economy. They'll do fine whether you're president or I am." Previously, Governor Romney has said that his tax plan would cut all individual income tax rates by 20%, eliminate the AMT, eliminate the estate tax, and eliminate taxes on investment income for low- and middle-income taxpayers. He would also extend all of the Bush-era tax cuts that are scheduled to expire at the end of 2012. Those tax cuts would reduce federal revenues by $480 billion in 2015 over and above the cost of extending the Bush tax cuts. Allow for some growth in income, and the total comes to over $5 trillion over ten years. Romney's admission that the wealthy will do fine under the Obama administration is interesting when considering his secret tape where he claimed he didn't have to worry about half of America, which would imply that he is really trying harder for the wealthy vote, hence the elimination of things like the estate tax - a benefit that disproportionately affects the rich. "At the same time, gasoline prices have doubled under the president. Electric rates are up. Food prices are up. Health care costs have gone up by $2,500 a family. Middle-income families are being crushed." Romney seemed to forget a time back in 2008 when gas prices were higher under President Bush then they are now, with the price per barrel of oil skyrocketing due to speculation to close to $150 before crashing to $30. Patrick DeHaan, senior petroleum analyst for GasBuddy.com, stated that a president has little effect on the price of gasoline and the price drop was more because of "recession/depression, collapse of consumer confidence, collapse of DEMAND, nothing else." That statement has been confirmed by other news outlets, including CBS News, the San Jose Mercury News, and the New York Times. "The second area, taxation, we agree, we ought to bring the tax rates down. And I do, both for corporations and for individuals. But in order for us not to lose revenue, have the government run out of money, I also lower deductions and credits and exemptions, so that we keep taking in the same money when you also account for growth." Romney seems to think that he can close enough loopholes and deductions to completely erase the loss in revenue from cutting taxes across the board. "The third area, energy. Energy is critical, and the president pointed out correctly that production of oil and gas in the U.S. is up. But not due to his policies. In spite of his policies. And, by the way, I like coal. I'm going to make sure we can continue to burn clean coal. People in the coal industry feel like it's getting crushed by your policies. I want to get America and North America energy independent so we can create those jobs." The first thing I noticed from Romney's comments were that he excluded drilling off the coast of Florida - a politically detrimental position to take when trying to court voters from a state dominated by tourism and ecologically sensitive areas. Back in August Romney issued an energy plan that called for more offshore drilling, but he seemed to exclude Florida from his debate performance, most likely to try and increase his chances in winning the state's massive number of electoral votes. Another thing is that Romney attacks the number of drilling permits issued by the administration, claiming all increases in production has come from private land. This is interesting when considering Romney's attack on the administration for not being conducive to energy production or job creation, but then using an instance of private industry doing well under the administration, and while Romney paints a pretty picture regarding the Keystone pipeline, the Canadian firms responsible for it expect the impact of the pipeline to increase prices by reducing the problem of "oversupply" and getting oil to the export markets. Romney's overall statement just happens to be false as well. Oil production has been up since 2007 and private enterprises are sitting on 7000 approved permits but are doing nothing with that opportunity to increase energy independence. "Well, but -- but virtually -- virtually everything he just said about my tax plan is inaccurate." What was this in response too? When you add up all the loopholes and deductions that upper-income individuals can -- are currently taking advantage of, you take those all away, you don't come close to paying for $5 trillion in tax cuts and $2 trillion in additional military spending. So Obama virtually described his plan inaccurately? That would mean that he literally described the plan, right? "So if the tax plan he described were a tax plan I was asked to support, I'd say absolutely not. I'm not looking for a $5 trillion tax cut. What I've said is I won't put in place a tax cut that adds to the deficit. That's part one. So there's no economist that can say Mitt Romney's tax plan adds $5 trillion if I say I will not add to the deficit with my tax plan." So because Mitt Romney says his tax plan will not add to the deficit, it won't, and economists would be forced to fall in line with the candidate? "Look, I've got five boys. I'm used to people saying something that's not always true." So Romney's five sons, who are also his campaign's surrogates, are liars? "And number three, I will not under any circumstances raise taxes on middle-income families. I will lower taxes on middle-income families. Now, you cite a study. There are six other studies that looked at the study you describe and say it's completely wrong. I saw a study that came out today that said you're going to raise taxes by $3,000 to $4,000 on middle-income families. There are all these studies out there. But let's get at the bottom line. That is, I want to bring down rates. I want to bring the rates down, at the same time lower deductions and exemptions and credits and so forth, so we keep getting the revenue we need. And you'd think, well, then why lower the rates." Romney brings into the debate "'six other studies" that studied Obama's study and declared that study to be wrong. This is funny because back in September, Mitt Romney claimed there to be just five studies that proved him right, so he must have picked up a study somewhere, but Romney's claims back then were declared by Politifact to be "mostly false," while declaring Obama's study to be "mostly true." Romney said that five studies show that his tax plan can cut rates and still bring in the same amount of money as today without raising taxes on the middle class. There is a fair argument to be made that the Tax Policy Center used an arbitrary dividing line of $200,000 to separate high-income households from all others. The same problem lies in setting the breakpoint at $100,000, a choice preferred by at least one of the defenders of Romney’s proposal. The studies from Feldstein and Rosen use 2009 data. That was an abnormal year and one that made it easier to make the math work for the Romney plan. The analysts could have chosen other years but decided not to. We see no more than two independent studies out of the five claimed. We rate the statement Mostly False. It is probably safe to say that those false assessments continue to accurately describe Romney's claims. The jury is still out for Romney's mysterious sixth study. "Now, and -- and I've talked to a guy who has a very small business. He's in the electronics business in -- in St. Louis. He has four employees. He said he and his son calculated how much they pay in taxes, federal income tax, federal payroll tax, state income tax, state sales tax, state property tax, gasoline tax. It added up to well over 50 percent of what they earned. And your plan is to take the tax rate on successful small businesses from 35 percent to 40 percent. The National Federation of Independent Businesses has said that will cost 700,000 jobs." This was one anecdote of Romney's that I found interesting. He references things like state and fuel taxes, which in Missouri income taxes can go as high as 6 percent, sales taxes are at 4.225 percent, and fuel taxes on both gasoline and diesel 17.3 cents per gallon (one of the lowest rates in the nation and almost the same amount as the federal excise tax). 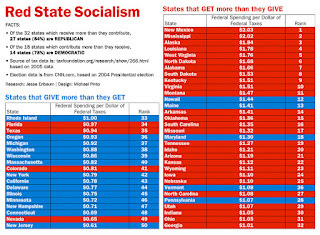 Not once in Romney's debate did he decry the problem with state taxes, believing the burden of diminished revenue should be placed solely on the federal government. 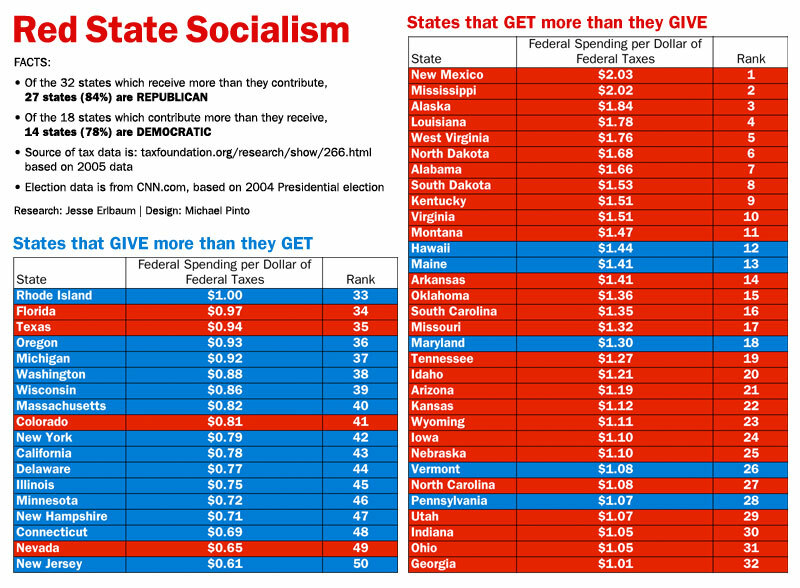 It is also worth mentioning that Missouri collects $1.32 for every federal dollar spent, meaning a reduction in federal taxes would hurt Missouri overall because the state would see decreased revenues - revenues that come from other states such as New Jersey, New York, Connecticut New Hampshire, California, Minnesota, or Delaware, to name a few. "My priority is putting people back to work in America. They're suffering in this country. And we talk about evidence. Look at the evidence of the last four years. It's absolutely extraordinary. We've got 23 million people out of work or stopped looking for work in this country. It's just -- it's -- we've got -- when the president took office, 32 million people on food stamps; 47 million on food stamps today; economic growth this year slower than last year, and last year slower than the year before." Romney references slower economic growth this year then last, and that is partially true, but Romney seems to think creating jobs will solve everything. That is wrong when considering you require market demand in order to warrant a supply. Part of the slow GDP growth for 2012 was a result from reduced demand from Europe, and as we recall from Romney's five-point plan from the beginning of the debate, he is more interested in trade with Latin America. "I'm sorry, Jim, I'm going to stop the subsidy to PBS. I'm going to stop other things. I like PBS, I love Big Bird. Actually like you, too. But I'm not going to -- I'm not going to keep on spending money on things to borrow money from China to pay for. That's number one. Number three, I'll make government more efficient and to cut back the number of employees, combine some agencies and departments. My cutbacks will be done through attrition, by the way." These are low-hanging fruit. The federal government's subsidies to The Corporation for Public Broadcasting amounted to $445 million dollars a year, which comes to about 1/100 of 1 percent of the federal budget. Romney of course would prefer to keep the bloated military budget alone. "Look, the revenue I get is by more people working, getting higher pay, paying more taxes. That's how we get growth and how we balance the budget. But the idea of taxing people more, putting more people out of work, you'll never get there. You'll never balance the budget by raising taxes." This is perhaps the most ignorant statement made by Romney in the entire debate. Just consider this study from the Economic Policy Institute that indicated CEO pay increased 725 percent more, more than more than 127 times faster than worker pay since 1978, and even despite the slow economic growth Romney criticized, 2011 saw executive pay increase while the average worker saw a decrease. The Department of Labor has also indicated that the productivity of workers had increased in that same period as well. The problem isn't getting more people to work. The problem is getting more executives to pay their employees more money (or hiring more employees) instead of hoarding their cash. It might be good to mention Nick Hanauer's TED Talk on income inequality in America from earlier this year and how they are even more relevant today. "First of all, the Department of Energy has said the tax break for oil companies is $2.8 billion a year. And it's actually an accounting treatment, as you know, that's been in place for a hundred years." Romney seems to defend oil subsidies, dismissing them as nothing more than an "accounting treatment," not a federal boondoggle, and that since it has been around for a hundred years it seems to be okay. Obama correctly interjected by saying "It's time to end it." "And in one year, you provided $90 billion in breaks to the green energy world. Now, I like green energy as well, but that's about 50 years' worth of what oil and gas receives. And you say Exxon and Mobil. Actually, this $2.8 billion goes largely to small companies, to drilling operators and so forth. The second topic, which is you said you get a deduction for taking a plant overseas. Look, I've been in business for 25 years. I have no idea what you're talking about. I maybe need to get a new accountant." It is funny that Romney attacks Obama's green energy initiatives by claiming the oil subsidies goes to small business brushing over the fact that companies like ExxonMobil paid a negative tax rate at times, meaning they got corporate welfare at a time of record profits in the billions! Romney also mentions things like Solyndra, which began under the Bush administration (meaning Republicans picked that loser), and other businesses claiming government investment in new technology is not that good, when success rates for government investment in green firms hovers around 91 percent. Romney's comments have also attracted negative attention from the investor class. Romney bashed private venture capital firms that have been largely successful in raising hundreds of millions of dollars as being losers. Ray Lane, a managing partner in the venture capital firm Kleiner Perkins and a prominent Fisker investor, criticized the GOP candidate citing the fact that because of investors like himself, companies have been able to employ thousands of Americans and create new products for the marketplace. He also criticized the candidate for inflating figures and attempting to give the appearance that the entire $90 billion was lost. "Well, Jim, our seniors depend on these programs, and I know anytime we talk about entitlements, people become concerned that something's going to happen that's going to change their life for the worse. And the answer is neither the president nor I are proposing any changes for any current retirees or near retirees, either to Social Security or Medicare. So if you're 60 or around 60 or older, you don't need to listen any further." This appears to be a subtle admission that Romney will eliminate Social Security and Medicare to younger Americans. "But on Medicare, for current retirees, he's cutting $716 billion from the program. Now, he says by not overpaying hospitals and providers. Actually just going to them and saying, "We're going to reduce the rates you get paid across the board, everybody's going to get a lower rate." That's not just going after places where there's abuse. That's saying we're cutting the rates. Some 15 percent of hospitals and nursing homes say they won't take anymore Medicare patients under that scenario." Romney failed to mention that the budget he supported authored by his running mate, Paul Ryan, kept those cuts. Ryan's defense: Obama did it first. "What I support is no change for current retirees and near-retirees to Medicare. And the president supports taking $716 billion out of that program." This was in response to a direct question from Lehrer asking if he supported a voucher system. Romney seems to indeed support vouchers, just for those who are not current or near-retirees. Romney then moved on to his love of insurance companies. "Number two is for people coming along that are young, what I do to make sure that we can keep Medicare in place for them is to allow them either to choose the current Medicare program or a private plan. Their choice. I know my own view is I'd rather have a private plan. I'd just assume not have the government telling me what kind of health care I get. I'd rather be able to have an insurance company. If I don't like them, I can get rid of them and find a different insurance company. But people make their own choice." Before Medicare's creation, only half of older adults had health insurance, with coverage often unavailable or unaffordable to the other half, because older adults had half as much income as younger people and paid nearly three times as much for health insurance. "Regulation is essential. You can't have a free market work if you don't have regulation. As a businessperson, I had to have -- I need to know the regulations. I needed them there. You couldn't have people opening up banks in their -- in their garage and making loans. I mean, you have to have regulations so that you can have an economy work. Every free economy has good regulation. At the same time, regulation can become excessive." Mitt Romney now loves regulation? Isn't the definition of a "free market" is one without regulation? "I sure do. Well, in part, it comes, again, from my experience. You know, I was in New Hampshire. A woman came to me and she said, look, I can't afford insurance for myself or my son. I met a couple in Appleton, Wisconsin, and they said, we're thinking of dropping our insurance, we can't afford it." But I thought Mitt Romney's solution was for individuals to accept greater responsibility in their lives and pay for their own insurance? Is there something fundamentally wrong with calling insurance and health care a "thing?" Televisions are things. Cars are things. Houses are things. Romney places the need for living a healthy life on par with purchasing a vehicle or computer. Remember from his secretly recorded video (which he now declares as wrong) - people should not be entitled to health care or food. "Fourth, there was a survey done of small businesses across the country, said, what's been the effect of Obamacare on your hiring plans? And three-quarters of them said it makes us less likely to hire people. I just don't know how the president could have come into office, facing 23 million people out of work, rising unemployment, an economic crisis at the -- at the kitchen table, and spend his energy and passion for two years fighting for Obamacare instead of fighting for jobs for the American people. It has killed jobs." If Romneycare is any indicator on job-killing capabilities of a mandate-based health care reform, Obamacare will not cause any job losses for the nation, based on a study by the Urban Institute. "And the best course for health care is to do what we did in my state: craft a plan at the state level that fits the needs of the state. And then let's focus on getting the costs down for people, rather than raising it with the $2,500 additional premium. " Romney seems to leave out the other important part of his health care overhaul - higher deductibles. As I had written a couple days ago, Mitt Romney wrote in the New England Journal of Medicine that lower premiums but higher deductibles would make health care more accessible by offering variety in the marketplace. "The result," Romney wrote, "will be patients who can confidently choose the coverage that is right for them, who know and care what healthcare costs." So for Romney, it is not a matter of what you pay, rather when you pay. Romney would like people to feel as if they are saving money by experiencing a lower premium but then they will pay more on the back end of the deal by having a higher deductible. And considering Romney has already started to fawn over positive aspects of Obamacare, such as the elimination of preexisting condition clauses, how exactly does Romney hope for all these wonderful private insurance companies to pay for these potential liabilities? This is why Romney had to include the Republican-supported mandate in his plan years ago, and why Obama rightly identified the mandate as a conservative idea. "Governor Romney said this has to be done on a bipartisan basis. This was a bipartisan idea. In fact, it was a Republican idea." "Well, actually it's -- it's -- it's a lengthy description. But, number one, preexisting conditions are covered under my plan. Number two, young people are able to stay on their family plan. That's already offered in the private marketplace. You don't have to have the government mandate that for that to occur." This seems to be the default answer from anybody from the Romney camp when asked to explain some of the details of their policy - it is either too long or too boring to explain. "But let's come back to something the president and I agree on, which is the key task we have in health care is to get the cost down so it's more affordable for families. And then he has as a model for doing that a board of people at the government, an unelected board, appointed board, who are going to decide what kind of treatment you ought to have." Romney sort of revives Sarah Palin's "death panels" in the debate by referring to these boards, whom by the way have statutory limits and who only act in an advisory position. "In my opinion, the government is not effective in -- in bringing down the cost of almost anything. As a matter of fact, free people and free enterprises trying to find ways to do things better are able to be more effective in bringing down the cost than the government will ever be. This is the private market. These are small -- these are enterprises competing with each other, learning how to do better and better jobs. I used to consult to businesses -- excuse me, to hospitals and to health care providers. I was astonished at the creativity and innovation that exists in the American people." Romney seems to believe that the Cleveland Clinic is an excellent example of an enterprising business hospital and health care provider. He seems to ignore the fact that they are a non-profit corporation which gives them a bit of an advantage from, say, for-profit corporations. This reduces some of the overhead involved. This is partially why government administration costs are lower then private businesses - no profit motive and lower overhead. "In order to bring the cost of health care down, we don't need to have a board of 15 people telling us what kinds of treatments we should have. We instead need to put insurance plans, providers, hospitals, doctors on target such that they have an incentive, as you say, performance pay, for doing an excellent job, for keeping costs down, and that's happening. Innermountain Healthcare does it superbly well, Mayo Clinic is doing it superbly well, Cleveland Clinic, others." So instead of a governmental advisory board offering suggestions for preferred treatments and such Romney would prefer an insurance adjuster and facility billing agents determine what is covered and what is not? Also, the Mayo Clinic is another non-profit organization. "Which is -- which is my experience as a governor is if I come in and -- and lay down a piece of legislation and say, "It's my way or the highway," I don't get a lot done. What I do is the same way that Tip O'Neill and Ronald Reagan worked together some years ago. When Ronald Reagan ran for office, he laid out the principles that he was going to foster. He said he was going to lower tax rates. He said he was going to broaden the base. You've said the same thing, you're going to simplify the tax code, broaden the base." What about that uncompromising position Romney took during the primary debates? Romney's running mate did refuse to rule out the 10-to-1 cuts recently, which brings us these question: Which is the lie? Will Romney refuse to compromise on such an issue like cuts-to-revenue increases or will he work with Democrats to find a middle ground, such as a 10-to-1, 5-to-1, or even a 2-to-1 deal? "In fact, I do have a plan that deals with people with pre-existing conditions. That's part of my health care plan." In actuality, Romney's plan isn't a plan at all. Romney essentially hopes that on day one of his presidency, after he repeals Obamacare, the individual states would decide to enact something like Romneycare to fill the void. "Well, first, I love great schools. Massachusetts, our schools are ranked number one of all 50 states. And the key to great schools, great teachers. So I reject the idea that I don't believe in great teachers or more teachers. Every school district, every state should make that decision on their own." Again, he criticized the president months ago for wanting to increase the number of teachers. "First, life and liberty. We have a responsibility to protect the lives and liberties of our people, and that means a military second to none. I do not believe in cutting our military. I believe in maintaining the strength of America's military." Remember. PBS is worth cutting. The military, which takes more then 50 percent (58 percent to be exact) of government spending is not worth a look at all. Even considering the fact that the United States spends more on defense then the 19 biggest spending nations combined, Romney believes this is off limits. "Mr. President, Mr. President, you're entitled as the president to your own airplane and to your own house, but not to your own facts." Was Romney referring to himself? This line of attack is similar to conservatives criticizing the president for traveling in Air Force One and was probably made for the benefit of the GOP base. Romney did an excellent job debating the president but not informing the public. He offered a vigorous attack refusing to submit to the rules of the debate or calls from the moderator while the president was calm, avoiding any major attacks against Romney, taking the higher road trying to explain his positions and outline the differences between himself and Romney, most notably that Romney seems to lack any transparency as a candidate. If you watched the debate you would get the impression that Romney won (although I felt him to be frantic and have a used car salesman sense about him). This was also in part for the horrible moderation by Jim Lehrer, who essentially allowed Romney to define the terms of the debate. If you read the debate, it would be close but Obama would come out the winner, and if you read and researched Obama would be the victor by far.